Dr. Nicholas Padis served as the ﬁrst President. The ﬁrst organizational meeting of the Club was held on October 26, 1936, at the Christian Association of the University of Pennsylvania. At that meeting, the membership numbered 16, a constitution was adopted, and a name selected – The Greek Professional Club of Philadelphia. Although it was later changed to Hellenic University Club of Philadelphia, the original Club initials, ΕΣΕ, signifying “Ellinikos Sillogos Epistimonon” (Hellenic Professional Association), have been retained. The Club’s ﬁrst ofﬁcial function was a banquet on November 19, 1936, held at the Manufacturers Club, with His Eminence Archbishop Athenagoras as the guest speaker. The following year, the Club members planned a formal celebration to commemorate the Day of Greek Letters honoring the Three Hierarchs of Greek Orthodoxy. The event was held on February 2, 1938, when the Club attended church as a group and one member delivered a speech before the congregation. The Philadelphia Greek-American community responded so enthusiastically that this observance became a ﬁrm tradition with the Club and is observed annually on the last Sunday in January. Outstanding in the prewar years was the institution of the Annual Dinner Dance, a formal function by which the Club members observe the Day of Greek Letters and dedicate themselves to worthy intellectual aims. The ﬁrst Dinner Dance was held on February 5, 1939, at the Benjamin Franklin Hotel. From the beginning, the Dinner Dance has been highlighted by addresses by distinguished individuals. Notable speakers over the years have included: Archbishop Athenagoras; Harold A. Stassen, signer of the United Nations Charter, governor of Minnesota and president of the University of Pennsylvania; Carlos P. Romulo, signer of the United Nations Charter and president of the United Nations General Assembly; John Brademas, U. S. Congressman from Indiana and president of New York University; Peter Liacouras, president of Temple University; Paul Sarbanes, U. S. Senator from Maryland; Michael Dukakis, governor of Massachusetts and presidential candidate; and Nicholas Gage, author of Eleni and New York Times journalist. As important as the caliber of the speakers was the disposition of the Dinner Dance proﬁts. The proﬁt from the ﬁrst Dinner Dance ($226.00) was sent to the Greek Orthodox Preparatory Theological Seminary. Proﬁts from the second Dinner Dance went into a newly formed Scholarship Fund; those from the third and fourth were given to Greek War Relief. The Dinner Dance was suspended during World War II, from 1942 to 1945. It was reinstituted in 1946, and from that time to the present, the Annual Dinner Dance proﬁts beneﬁt the Club’s Scholarship Fund. Also established during this period was the Club’s Friday night lecture series. In keeping with the spirit of paideia, these lectures covered cultural, historic, and practical themes and were presented by guest speakers and Club members. During the war years, the Club, under the leadership of its female members, continued to function. A large part of the members’ energies was channeled into war-related work with the Emergency Aid Bazaar and the Greek War Relief. With the arrival of peace, the Club regained its prewar vigor. The membership and activities expanded greatly during its second and third decades. New members were added, especially young graduates. The Constitution was revised and the Club was formally chartered as a nonproﬁt corporation under the laws of Pennsylvania on March 8, 1947. Since then, ofﬁcial monthly board meetings, consisting of the Ofﬁcers, the Board of Directors, and Committee Chairpersons, have taken over the general business of the Club, formulating policies, establishing budgets, and overseeing the work of the various committees. The program series, comprising four or ﬁve lectures, branched out to include practical as well as cultural subjects. Lecture topics focused on Greek themes, both ancient and modern, and practical subjects such as income taxes and salesmanship. The broad range in subject matter continues to the present day. The most notable postwar expansion was in the area of social activities which included Christmas, New Year, and masquerade and card parties; teas, picnics, ﬁshing trips, and square dances; group outings to the theater, Robin Hood Dell, the beach, baseball and football games; and the very successful annual Parents Day Luncheon or Tea. It was in this period that the Club gave prompt approval to the Philadelphia Federation of Hellenic American Societies to which we have sent delegates for many years. A signiﬁcant fact is that nearly all of the Federation’s early presidents were members of the Hellenic University Club. Early in the 1970s, the Club formed its own theater group and presented two Greek comedies in Greek to the greater Philadelphia community. In the early seventies, the Hellenic University Club Library was created to make books on a wide variety of Hellenic subjects, in both Greek and English, available to the Club members. Over the years, books were purchased by the Club or donated by members and friends. The books circulated through special exhibits and loan requests. 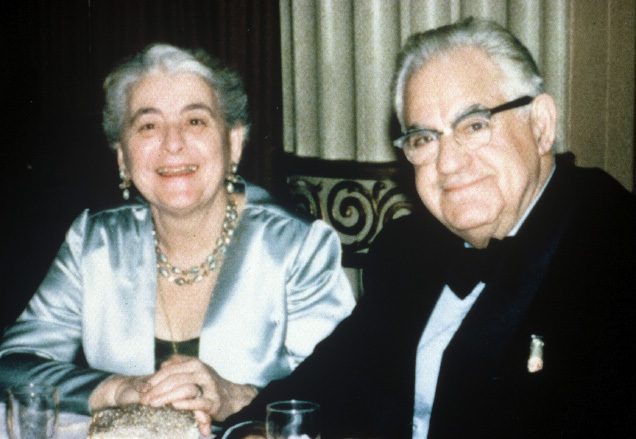 To mark the nation’s Bicentennial celebration in 1976, four major events were organized by the Club under the banner “The Hellenic Perspective.” Contributions of Greek-Americans to the Social Sciences, the Arts, the Natural Sciences, and the Humanities were focused upon. Three of the events were symposia held at the University of Pennsylvania and Thomas Jefferson University. The fourth was a concert and exhibit of ﬁne art by Greek-American artists and was staged at the Balch Institute. In 1976, the Club’s logo was redesigned, and at the suggestion of Dr. Nicholas Padis, included the Athenian tetradrachma from the ﬁfth century B.C. This ancient coin depicts the owl, which was sacred to the Greek goddess Pallas Athena, the embodiment of wisdom, reason, and knowledge. The spray of olives represents the tree, which is traditionally Athena’s gift to mankind. Another highlight of the decade was the Club’s 40th anniversary celebration during the 1976 Annual Dinner Dance. Dr. Nicholas Padis, the ﬁrst president, served as toastmaster; Peter Liacouras, then dean of the Law School and later president of Temple University, was the guest speaker; and the 40-year members of the Club were honored. During this period, Club activities increased with the inception of the Spring Arts Event, featuring exhibits and concerts by local artists and musicians. Other special events included opera and theater trips to New York City and the annual canoe trip in the Southern New Jersey Pine Barrens. The 1970s also saw the sons and daughters of founding and ﬁrst generation members joining and becoming active in the Club. During the 1980s, the Club launched a major scholarship fund-raising drive, which raised over $30,000 in three years. A goal of $100,000 by 1990 was established for the Scholarship Fund in order to grant more and larger scholarships. The entire scholarship program was reorganized with the creation of a new Hellenic University Club Scholarship Fund, which became an umbrella for the various scholarships granted by the Club, and the creation of the Scholarship Fund Investment Committee, which is responsible for the management and investment of the funds. This decade marked the celebration of the Club’s 50th anniversary in March 1986 with a gala dinner dance at the Merion Cricket Club honoring the founding members and past presidents. In the 1990s, the Hellenic University Club Library was expanded. The collection of books grew to well over 200 volumes that refer to the Hellenic heritage and Hellenic culture and its inﬂuence through ancient, medieval, and modern times. Its diverse subject matter made it a source for scholarly research as well as personal literary enjoyment. Additionally, a special section on children’s literature was created. In 1992, the Library Development Fund was established. It grew to nearly $9,000 through the generous support of members and friends. In 1994, at the University of Pennsylvania, the Club organized a half-day symposium commemorating the 2,500th anniversary of the birth of democracy. Entitled “Democracy: The Legacy, The Present, The Future,” this event drew a large audience of Club members, friends, and academicians. In February 1996, the Club’s 60th anniversary was celebrated at the Annual Dinner Dance. Dr. Constantine Papadakis, President of Drexel University, was presented with the Club’s ﬁrst Achievement Award in recognition of his contributions to the ﬁeld of education. The Achievement Award is given to persons of extraordinary achievement in their field of activity whose life work contributes to or supports the mission of the Club. Since its inception, 16 individuals have received this award. In 2000, the Club welcomed the new Millennium with a series of programs featuring outstanding Greek-Americans in the Philadelphia region. In a special ceremony on the Day of Greek Letters in January of 2002, the Hellenic University Club Library Collection was transferred to the Center for Hellenic Studies at Temple University. This permanent location allows for increased access and use of these books by Club members, faculty and students. The Athens 2004 Olympics was the topic of two programs: “Greece & the Modern Olympics” preceding the Olympics, and a post-Olympics panel presentation, “Reﬂections on the Athens 2004 Olympic Games.” In the spring of 2004, the Club organized and presented a full-day Symposium titled “Metropolis: Athens and Philadelphia” at the University of Pennsylvania Museum. The program featured four distinguished Penn professors as speakers on ancient Greek drama, Greek antiquities, and ancient athletics. In February of 2005, the Club’s 22 Emeritus Members were honored at the Annual Dinner Dance celebrating their ﬁfty or more years of continuous membership. Also in 2005, the Board of Directors created the Axios Award, recognizing a member’s outstanding service to the Hellenic University Club of Philadelphia. Six members have received this award. In June of 2007, after 4 years of work by the Strategic Planning Committee, the revised Constitution and Bylaws were ratiﬁed by the members at the Annual Business Meeting. During the 2010-11 year, we celebrated the Club’s 75th Anniversary. In February of 2011, at the Diamond Jubilee Dinner Dance, Professor Edmund Keeley was the recipient of the Club’s first Paideia Award. This Award is given to persons representing extraordinary learning or scholarship whose life work, mission, and accomplishments honor our Hellenic heritage. To mark the beginning of the Club’s 80th anniversary year, a Presidents Luncheon was held in November 2015 honoring the past presidents. On March 5, 2016, the Club’s 80th Anniversary was celebrated with a festive Birthday Party at the Merion Cricket Club. This event featured entertainment for the whole family—DJ, magician, caricaturist, “photo booth” and music that spanned eight decades. In March 2016 we also launched the Scholarship Fundraising Initiative, a major drive to increase the HUC Scholarship Fund to $1,000,000. Our 80th Anniversary Lecture Series included a Day Trip to New York to view a special exhibit at the Onassis Cultural Center. This celebratory year will culminate with the 80th Anniversary Gala on November 26, 2016. The Hellenic University Club continues to thrive. Through our social networking events we are attracting a new group of young members who are taking an active part in Board positions and committees. We continue to offer a varied calendar of lecture programs, cultural events, excursions, and socials. The Annual Dinner Dance/Gala is the highlight of each Club year, and proceeds from this event benefit the Hellenic University Club of Philadelphia Scholarship Fund.